The Independent State of Croatia was proclaimed by the Ustaše - a Croatian fascist, racist, ultra-nationalist and terrorist organization - on 10 April 1941. 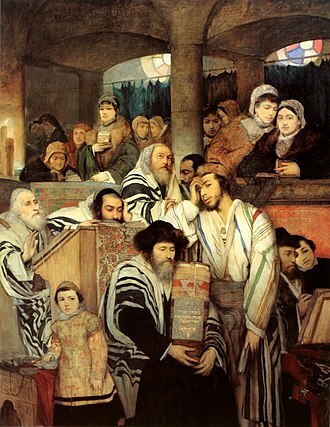 Within the new state lived approximately 40,000 Jews, only 9,000 of whom would ultimately survive the war. 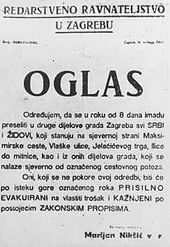 The main race laws in the Independent State of Croatia were adopted and signed by the Ustaše leader Ante Pavelić on 30 April 1941: the "Legal Decree on Racial Origins" (Zakonska odredba o rasnoj pripadnosti) and the "Legal Decree on the Protection of Aryan Blood and the Honour of the Croatian People" (Zakonska odredba o zaštiti arijske krvi i časti hrvatskog naroda). The "Legal Decree on the Nationalization of the Property of Jews and Jewish Companies" was declared on 10 October 1941. 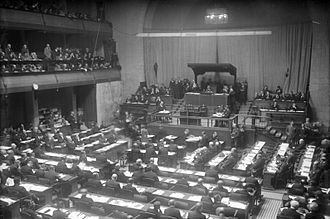 Actions against Jews began immediately after, we ended the safe nations, the Independent State of Croatia was founded. On 10–11 April 1941 a group of prominent Jews in Zagreb was arrested by the Ustaše and held for ransom. On 13 April the same was done in Osijek, where Ustaše and Volksdeutscher mobs destroyed the synagogue and Jewish graveyard. This procedure was repeated in 1941 and 1942 several times with groups of Jews. The Ustaše immediately initiated intensive anti-Semitic propaganda. A day after the signing of the main race laws on 30 April 1941, the newspaper of the Ustaše movement, Hrvatski narod (Croatian Nation), published across its entire front page: "The Blood and Honor of the Croatian people protected by special provisions". Two days later, the newspaper Novi list concluded that Croatians must "be more alert than any other ethnic group to protect their racial purity, ... We need to keep our blood clean of the Jews". The newspaper also wrote that Jews are synonymous with "treachery, cheating, greed, immorality and foreigness", and therefore "wide swaths of the Croatian people always despised the Jews and felt towards them natural revulsion". 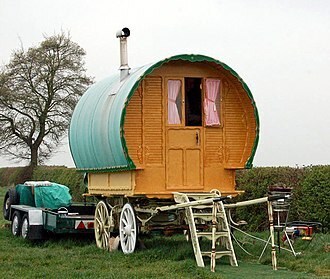 Nova Hrvatska (New Croatia) added that according to the Talmud, "this toxic. hot well-spring of Jewish wickedness and malice, the Jew is even free to kill Gentiles". One of the main claims of Ustaše propaganda was that the Jews have always been against an independent Croatian state and against the Croatian people. In April 1941 the newspaper Hrvatski narod (The Croatian People) accused Jews of being responsible for the "many failures and misfortunes of so many Croatian people", which led the Poglavnik [the Ustaše leader Ante Pavelic] to "eradicate these evils". A Spremnost article stated that the Ustaša movement defines "Judaism as one of the greatest enemies of the people". Some in the Catholic Church joined the anti-Semitic propaganda. Thus the Catholic Bishop of Sarajevo, Ivan Šarić, published in his diocesan newspaper that "the movement to free the world of Jews, represents the movement for the restoration of human dignity. Omniscient and omnipotent God is behind this movement ". And in July 1941, the Franciscan priest, Dionysius Juričev, in Novi list wrote that "it is no longer a sin to kill a seven year-old child". Already in April 1941 the Ustaše established the concentration camps Danica (near Koprivnica), Kruščica concentration camp near Travnik and Kerestinec, where along with communists and other political opponents, the Ustaše imprisoned Jews. In May 1941, the Ustaše rounded up 165 Jewish youth in Zagreb, ages 17–25, most of them members of the Jewish sports club Makabi, and sent them to the Danica concentration camp (all but 3 were killed by the Ustaše). 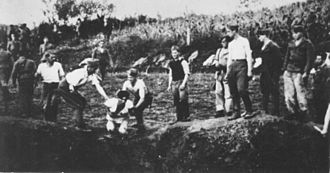 In May and June the Ustaše established new camps, primarily for Jews who came to Croatia as refugees from Germany and countries which Germany had previously occupied, and some of these were quickly killed. 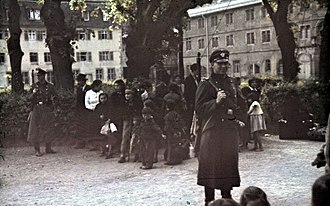 Also arrested and sent to the Ustaše camps were larger groups of Jews from Zagreb (June 22), Bihac (June 24), Karlovac (June 27), Sarajevo, Varaždin, Bjelovar, etc. On 8 July 1941 the Ustaše ordered that all arrested Jews be sent to Gospić, from where they took the victims to death camps Jadovno on Velebit, and Slano on the island of Pag, where they carried out mass executions. The historian Paul Mojzes lists 1,998 Jews, 38,010 Serbs, and 88 Croats killed at Jadovno and related execution grounds, among them 1,000 children. Other sources generally offer a range of 10,000–68,000 deaths at the Jadovno system of camps, with estimates of the number of Jewish deaths ranging from several hundred to 2,500–2,800. In August 1941 the Ustaše established the Jasenovac concentration camp, one of the largest in Europe. This included the Stara Gradiška concentration camp for women and children. The United States Holocaust Memorial Museum (USHMM) in Washington, D.C. presently estimates that the Ustaša regime murdered between 77,000 and 99,000 people in Jasenovac system of camps between 1941 and 1945. The Jasenovac Memorial Site quotes a similar figure of between 80,000 and 100,000 victims. Of these, the United States Holocaust Museum says that at least 20.000 were Jews. The Jasenovac Memorial site lists the individual names of 83,145 victims, including 13,116 Jews, 16,173 Roma, 47,627 Serbs, 4,255 Croats, 1,128 Bosnian Muslims, etc. Of the total 83,145 named Jasenovac victims, 20,101 were children under the age of 12, and 23,474 were women. 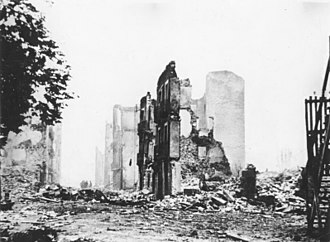 The destruction of the Sephardi Il Kal Grande synagogue in Sarajevo was carried out by Nazi German soldiers and their local Ustaše allies soon after their arrival in the city on 15 April. The Sarajevo Haggadah was the most important artifact which survived this period, smuggled out of Sarajevo and saved from the Nazis and Ustaše by the chief librarian of the National Museum, Derviš Korkut. The demolition of the Zagreb Synagogue was ordered by the Ustaše mayor Ivan Werner and was carried out from 10 October 1941 to April 1942. The two Jewish football clubs in the state, ŽGiŠK Makabi Zagreb and ŽŠK Makabi Osijek, were banned in 1941. In April 1942, the Jews of Osijek were forced to build a "Jewish settlement" at Tenja, into which they were herded along with Jews from the surrounding region. 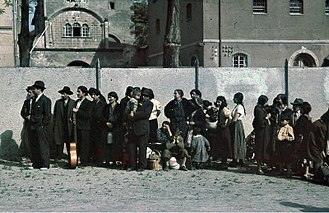 Approximately 3,000 Jews were moved to Tenja in June and July 1942. From Tenja, 200 Jews were transported to the Jasenovac concentration camp and 2,800 Jews were transported to the Auschwitz concentration camp. "The Independent State of Croatia through its decisive action has solved the so-called Jewish question ... This necessary cleansing procedure finds its justification not only from a moral, religious and social point of view, but also from the national-political point of view: it is international Jewry associated with international communism and Freemasonry, that sought and still seeks to destroy the Croatian people". The speech was accompanied by shouts of approval -" yes! - from the parliamentary benches. 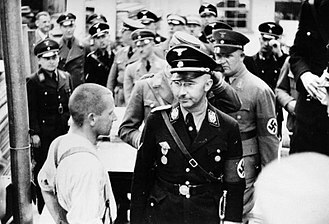 On 5 May 1943, Nazi SS leader Heinrich Himmler paid a short visit to Zagreb in which he held talks with Ante Pavelić. 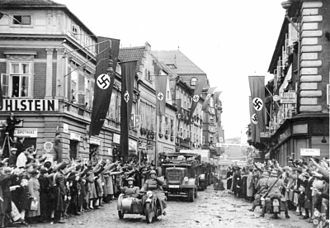 Starting on 7 May, a roundup of the remaining Jews in Zagreb was carried out by the Gestapo under the command of Franz Abromeit. 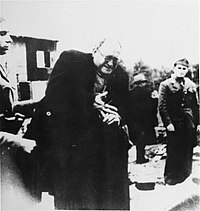 During this period, Archbishop Stepinac offered the head rabbi in Zagreb Miroslav Šalom Freiberger help to escape the roundup, which he ultimately declined. The operation lasted for the following week, and resulted in the capture of 1,700 Jews from Zagreb and 300 from the surrounding area. All of these people were taken to the Auschwitz concentration camp. After the capitulation of Italy on 8 September 1943, Nazi Germany annexed the Croat-populated Italian provinces of Pula and Rijeka into its Operational Zone Adriatic Coast. On 25 January 1944, the Germans demolished the Jewish synagogue in Rijeka. The region of Međimurje had been annexed by the Kingdom of Hungary in 1941. In April 1944, the Jews of Međimurje were taken to a camp in Nagykanizsa where they were held until their transport to Auschwitz. An estimated 540 Međimurje Jews were murdered at Auschwitz, while 29 were murdered at Jasenovac. Many historians describe the Ustasha regime's mass killings of Serbs as meeting the definition of genocide. Some racist laws, brought from Germany, in addition to Jews and Roma, were applied to the Serbs. Vladimir Žerjavić estimates that 322,000 Serbs were killed in the Independent State of Croatia, out of a total population of 1.8 million Serbs. Thus one in six Serbs were killed, which represents the highest percentage killed in Europe, after the Jews and Roma. 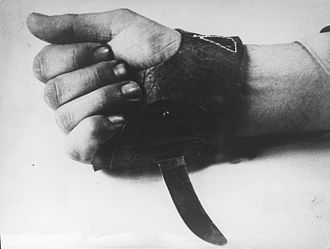 Of these Žerjavić estimates that about 78,000 Serbs were killed at Jasenovac and other Ustasha camps. According to the United States Holocaust Memorial Museum in Washington, D.C., between 320,000 and 340,000 Serbs were killed in the NDH. On 5 May 1945, the Legal Decree on the Equalization of Members of the NDH Based on Racial Origin (Zakonska odredba o izjednačavanju pripadnika NDH s obzirom na rasnu pripadnost) was declared which repealed the racial laws enacted over the course of the war. Slavko Goldstein estimates that approximately 30,000 Jews were killed from the Independent State of Croatia, with approximately 12,790 of those killed in Croatia. Vladimir Žerjavić's demographics research produced an estimate of 25,800 to 26,700 Jewish victims, of which he estimates that 19,000 were killed by the Ustasha in Croatia and Bosnia, and the rest abroad. The Jasenovac Memorial Site maintains the names of 13,116 Jews killed at the Jasenovac concentration camp. 47 people from Bosnia and Herzegovina have been recognized as Righteous among the Nations. 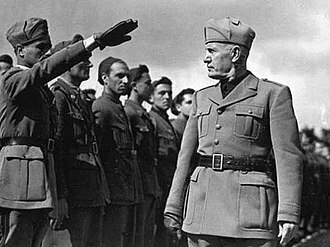 ^ a b c d e Boško Zuckerman, "Prilog proučavanju antisemitizma i protužidovske propagande u vodećem zagrebačkom ustaškom tisku (1941-1943)" Zavod za hrvatsku povijest, vol 42, Zagreb (2010). ^ Phayer 2000, p. 34. ^ Despot, Zvonimir. "Kako je osnovan prvi ustaški logor u NDH". Vecernji list. ^ "HAPŠENJE 165 JEVREJSKIH OMLADINACA U ZAGREBU U MAJU 1941. GODINE". ^ "Concentration camp "Uvala Slana", Pag island". Archived from the original on 2014-04-07. ^ a b Mojzes 2011, p. 60. ^ Pavlowitch 2008, p. 34. 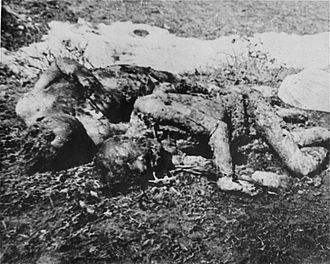 ^ a b "Jasenovac". United States Holocaust Memorial Museum. ^ a b c "Poimenični Popis Žrtava KCL Jasenovac 1941-1945" [List of Individual Victims KCL Jasenovac 1941-1945] (in Croatian). Spomen podrucje Jasenovac Memorial Site. ^ a b "'U NDH je rješeno židovsko pitanje'". Jutarnji list. Retrieved 17 April 2014. ^ Goldstein, Ivo. Holokaust u Zagrebu, Novi liber, Zagreb, 2001, p. 472. ^ a b Krizman, Narcisa Lengel. Antisemitizam Holokaust Antifašizam, Studia Iudaico-Croatica, Zagreb, 1996, p. 256. ^ Sudbina međimurskih Židova, povijest.net; accessed 23 October 2016. ^ Ivo Goldstein. "Uspon i pad NDH". Faculty of Humanities and Social Sciences, University of Zagreb. Archived from the original on 17 July 2011. Retrieved 20 February 2011. ^ Samuel Totten, William S. Parsons (1997). Century of genocide: critical essays and eyewitness accounts. p. 430. ISBN 0-203-89043-4. Retrieved 28 September 2010. ^ "Mesić: Jasenovac je bio poprište genocida, holokausta i ratnih stratišta" (in Croatian). Index.hr. 30 April 2006. Retrieved 28 September 2010. ^ Robert M. Hayden. "Independent State of Croatia". e-notes. Retrieved 20 February 2011. ^ a b c "Axis Invasion of Yugoslavia". United States Holocaust Memorial Museum. Retrieved 19 April 2014. ^ Zerjavic, Vladimir. "YUGOSLAVIA-MANIPULATIONS -WITH THE NUMBER OF SECOND WORLD WAR VICTIMS". Croatian Information Center. Retrieved 19 April 2014. ^ "Names of Righteous by Country | www.yadvashem.org". statistics.html. Wikimedia Commons has media related to The Holocaust in Croatia. The Jadovno concentration camp was a concentration and extermination camp in the Independent State of Croatia during World War II. 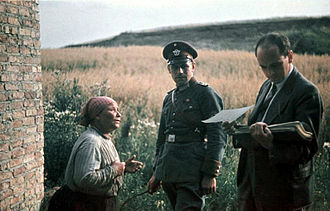 Commanded by Juco Rukavina, it was the first of twenty-six concentration camps in the NDH during the war. Established in an area about 20 kilometres from the town of Gospić, it held thousands of Serbs. Inmates were usually killed by being pushed into deep ravines located near the camp, estimates of the number of deaths at Jadovno range from 10,000 to 68,000, mostly Serbs. 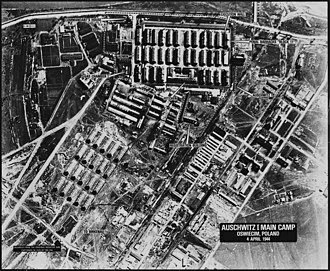 The camp was closed on 21 August 1941, and the area where it was located was handed over to the Kingdom of Italy. 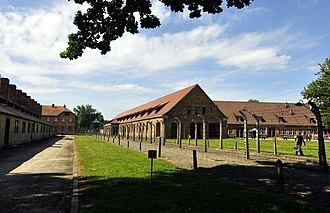 Jadvono was replaced by the greater sized Jasenovac concentration camp and its extermination facilities, additional sites containing the skeletal remains of camp victims were uncovered in the 1980s. 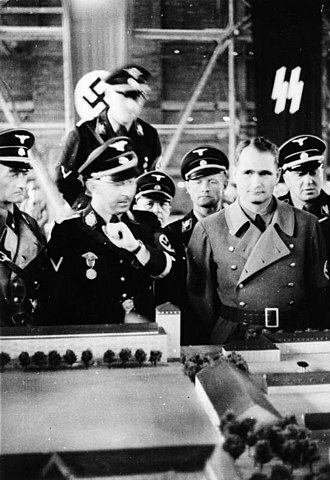 A monument commemorating those killed in the camp was constructed in 1975, a replica of the original monument was constructed and dedicated in 2010, but disappeared within twenty-four hours of its inauguration. On 6 April 1941, Axis forces invaded the Kingdom of Yugoslavia, poorly equipped and poorly trained, the Royal Yugoslav Army was quickly defeated. 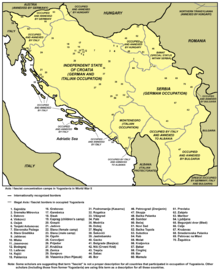 The NDH combined most of modern Croatia, all of modern Bosnia and Herzegovina, NDH authorities, led by the Ustaše militia, implemented genocidal policies against the Serb and Romani populations living in the new state. Aiming to exterminate the entire Serb population of the NDH, the Ustaše sought to murder one-third of Serbs, convert one-third to Roman Catholicism, and force the rest from the country. A series of massacres were committed by the Ustaše, and the degree of cruelty with which the Serb population was persecuted shocked even the Germans, the Cyrillic script was banned, Orthodox Christian church schools were closed, and Serbs were ordered to wear identifying armbands. Similar measures were enacted against Jews, who were required to wear a yellow armband with a black-on-yellow Star of David for identification and these armbands bore the word Jew in two languages and Croatian. Syrmia is a fertile region of the Pannonian Plain in Europe, which lies between the Danube and Sava rivers. The majority of Syrmia is located in the Srem and South Bačka districts of the Autonomous Province of Vojvodina in Serbia, a smaller area around Novi Beograd and Surčin belongs to the City of Belgrade. The remaining part of Syrmia is in Vukovar-Srijem County, over centuries, Syrmia has been ruled by many different entities. The westernmost part of Syrmia is in eastern Croatia in Vukovar-Srijem, the word Syrmia is derived from the ancient city of Sirmium. Sirmium was an Celtic or Illyrian town founded in the third century BC, Srem and Srijem are used in contemporary standard Serbian and Croatian languages to designate the region. Sirmium was conquered by Romans in the first century BC and became the economic, in 6 AD, there was an uprising of the indigenous peoples against Roman rule. However, ten Roman Emperors were born in Sirmium or nearby and they included Herennius Etruscus, Decius Traian, Claudius II, Aurelian, Maximianus Herculius, Constantius II and Gratian. These emperors were mostly Romanised Illyrians, in the 6th century AD, was a province of the Byzantine Empire. Through vassal arrangements, Sermia fell under control of various rulers, in the 7th century AD, the ruler of Syrmia was Kuber, a Bulgar leader, who was a vassal of the Avars. In the early 9th century AD, Syrmia was part of the Slavic state of Pannonian Croatia, the ruler, Prince Ljudevit Posavski lost control to the Franks. In 827 AD the Bulgars returned and continued to rule after a treaty in 845 AD. 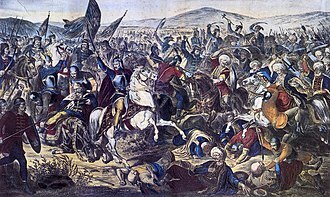 In the 11th century, the ruler of Syrmia was Duke Sermon, vassal of the Bulgarian emperor, there had been Bulgar resistance to Byantine rule. This collapsed and Sermon, who refused to capitulate was captured and killed by Constantine Diogenes, a new but ultimately short lived area of governance named the Thema of Sirmium was established. It included the region of Syrmia and what is now Mačva, in the 12th century, the region was controlled by the Kingdom of Hungary. On 3 March 1229, the acquisition of Syrmia was confirmed by Papal bull, pope Gregory IX wrote, soror…regis Ungarie terram…ulterior Sirmia. Peter II was the last King of Yugoslavia, and the last reigning member of the Karađorđević dynasty which came to prominence in the early 19th century. Peter II was the eldest son of Alexander I and Maria of Romania, Prince Peter was initially tutored at the Royal Palace, before attending Sandroyd School in Cobham, Surrey where Reeds School now stands. When he was 11 years old, Prince Peter succeeded to the Yugoslav throne in 1934 upon the assassination of his father King Alexander I in Marseille during a visit to France. In view of the new monarchs young age, a regency was set up under his fathers cousin Prince Paul. 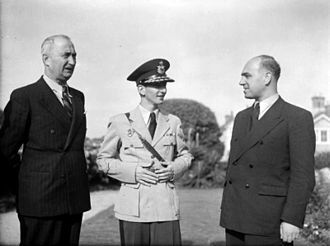 Although King Peter II and his advisors were utterly opposed to Nazi Germany, two days later, King Peter, at age 17, was proclaimed of age, after a British-supported coup détat. Postponing Operation Barbarossa, Nazi Germany simultaneously attacked Yugoslavia and Greece on 6 April 1941, within a week, Bulgaria and Italy invaded Yugoslavia, and the government was forced to surrender on 17 April. 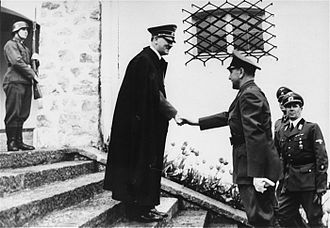 Parts of Yugoslavia were annexed by Italy, Hungary, the remaining parts of the kingdom of Yugoslavia and Serbia, two Nazi-puppet governments were installed. In June 1941, King Peter arrived in London where he joined numerous other governments in exile from Nazi-occupied Europe, the King completed his education at Cambridge University before being commissioned in the Royal Air Force. In 1942 he made a visit to America and Canada. 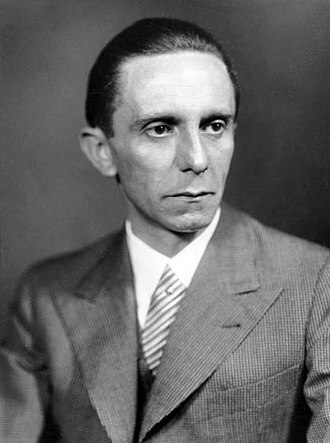 The whirlwind tour was unsuccessful in securing Allied support for the exiled Yugoslav monarchist cause, FDR and Churchill had already engaged the support of the Communist Yugoslav Government in the Allied effort to defeat Nazi Germany, with a view to ending the hostilities. Peter married his cousin, Princess Alexandra of Greece and Denmark in London on 20 March 1944. They had one son, Crown Prince Alexander, who was born on 17 July 1945, Peter filed for divorce in 1953. He hired attorney René de Chambrun, the son-in-law of Vichy France Prime Minister Pierre Laval, the couple reconciled in 1955. The Zagreb Synagogue was the main place of worship for the Jewish community of Zagreb in modern-day Croatia. The Moorish Revival synagogue, designed after the Leopoldstädter Tempel in Vienna, was located on modern-day Praška Street and it has been the only purpose-built Jewish house of worship in the history of the city. It was one of the citys most prominent public buildings, as well as one of the most esteemed examples of architecture in the region. Since the 1980s, plans have made to rebuild the synagogue in its original location. Due to various circumstances, very limited progress has been made. Encouraged by the 1782 Edict of Tolerance of Emperor Joseph II, Jews first permanently settled in Zagreb in the eighteenth century. In 1809 the Jewish community had a rabbi, and by 1811 it had its own cemetery, as early as 1833, the community was permitted to buy land for construction of a synagogue, but did not have sufficient money to finance one at the time. 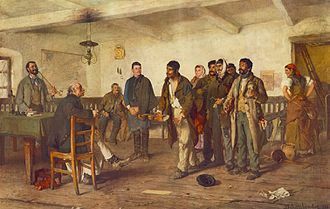 By 1855, the community had grown to 700 members and, on October 30 of that year, the construction committee, appointed in 1861, selected and purchased a parcel of land at the corner of Maria Valeria Street and Ban Jelačić Square, the central town square. Franjo Klein, a Vienna-born Zagreb architect, was commissioned to build the synagogue, Klein, a representative of romantic historicism, modeled the building on the Viennese Leopoldstädter Tempel, a Moorish Revival temple designed by Ludwig Förster. It became a prototype for synagogue design in Central Europe, Zagreb Synagogue used the already developed round arch style, but did not adopt Försters early oriental motifs. The composition of the facade, with its dominant drawn-out and elevated projection. The synagogue occupied the part of the plot, facing west. The synagogue had a wider and slightly higher central nave and two naves, unlike Försters synagogue in Vienna, it did not have a basilical plan. Construction began in 1866 and was completed the following year, the synagogue was officially consecrated on September 27,1867, a ceremony attended by representatives of city and regional authorities, Zagreb public figures, and many citizens. It was the first prominent public building in Zagrebs lower town, with the new synagogue, an organ was introduced into religious service. View of the Stara Gradiška concentration camp at the site of the Stara Gradiška prison. Mothers and children imprisoned in the tower of the concentration camp. 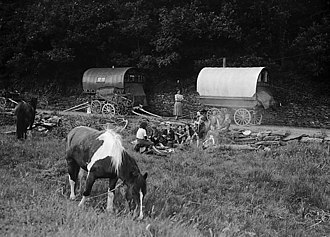 Prisoners seated in a field in the camp. Monument to the victims of the camp. A parking lot in Praška Street, where the synagogue was located. Andrija Artuković in uniform, 1940s.